If the birdwatchers of Forest Park ever organized, Forest Park volunteer John Miller would be a shoo-in for the position of Purple Martin Maestro. This August, as he has every August since 2005, Miller started wrapping up another summer of tending to Forest Park’s Purple Martin boxes and saying farewell to the graceful, purple-tinged birds that call them home. Forest Park boasts Purple Martin housing — the white, gourd-shaped homes and apartment-like complexes — throughout the Park, placed on posts around Norman K. Probstein Golf Course, Highlands Golf Course, Wildlife Island and the prairie near Steinberg Skating Rink. In total, the gourds and complexes provide 78 nesting units. Installing them in 2005 was Miller’s idea, and maintaining them is his passion. That first year, eight brave pairs of Purple Martins made the 3,000-mile annual journey from their winter home in Brazil’s Amazon basin to Forest Park. 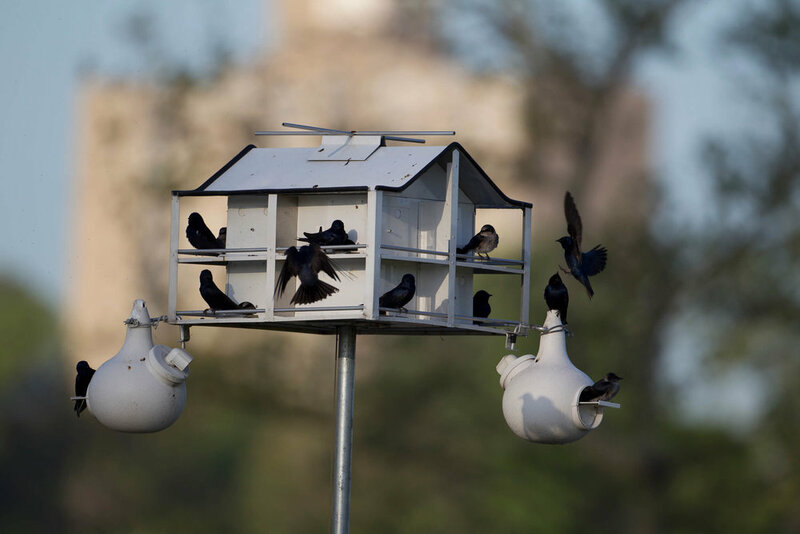 Today, about 70 Purple Martin pairs make that same trip to live in the Park and hatch and tend to their young from March to August, giving Forest Park what Miller says is the largest urban population of Purple Martins in North America. Like Miller, Purple Martins depend on other people. More than 1,000 years ago, Native Americans started building habitats for them out of gourds to attract the friendly birds. Colonial Americans later built housing for the birds as well. Over time, the species underwent what ornithologists call a “tradition shift.” They became more dependent on humans providing their homes and less dependent on finding old woodpecker holes and other natural cavities. The birds also benefit from human activity to keep predators away — like that of the players and carts on the golf courses. Miller’s interest in Purple Martins started when he was a kid maintaining a Purple Martin box in his grandfather’s Kentucky yard. He put up some of his own boxes as a teenager before becoming a newspaper reporter in Paducah. Later, he worked in public relations at Murray State University and Barnes Jewish Hospital before starting his own communications business at home. He is a proud member of the nonprofit Purple Martin Conservation Association and presents educational programs about the birds around the area. Now semi-retired, Miller enjoys keeping Forest Park’s Purple Martin units cleaned and maintained — and keeping a close eye on the birds themselves throughout their spring-summer visit. Miller adds that some Purple Martins have probably been nesting in the City for many decades. In fact, he found a St. Louis Post-Dispatch article from 1916 that mentions the birds being spotted in Forest Park. However, Forest Park isn’t the only place Miller works with the region’s Purple Martin population. He also takes care of boxes at Cahokia Mounds and the Missouri Botanical Garden. The long-standing colony at the Missouri Botanical Garden was what inspired him to first approach Anabeth Weil, then the Forest Park Manager, about installing those first boxes at the prairie near Steinberg Skating Rink. Weil agreed, and Jack Parker — the owner of O’Connell’s Pub, which also has Purple Martin boxes on its property at Kingshighway and Interstate 44 — helped pay for the prairie units. Fortuitously that first year, Norman K. Probstein Golf Course erected a few houses as part of its renovation project, and Miller volunteered to help monitor and manage the units. Highlands Golf Course got into the Purple Martin effort last year, erecting a house that Miller secured from a donor. Forest Park Forever funded the Purple Martin house on the west end of Wildlife Island, and Miller says the organization provides support whenever he — or the birds — need it. “Again, I can’t do this alone — it’s a true partnership,” Miller says. “My friend Dan Mertens did a lot of the ‘heavy lifting’ to install the houses on in the prairie near Steinberg Rink and on Wildlife Island, both Forest Park Forever-managed areas. Another volunteer, Jack Hambene, helps maintain the units at the Norman K. Probstein and Highland golf courses. And, of course, the City of St. Louis and Forest Park Forever do more than their share.